You have heard of pedagogy. You may have heard of andragogy. Pedagogy is the art or science of teaching and really has always focused on children. Andragogy is the theory and practice of teaching adults, and it comes directly out of pedagogy that did not address the specific needs in the education of adults. Pedagogy is very old but andragogy only appeared as a field in the mid-1800s and in a more recent approach in the 1960s with the work of Malcolm Knowles. Some of the basic principles of andragogy are that, compared to children: Adults will learn only what they feel they need to learn. They are practical in their approach to learning. They will more easily accept learning a theory before that theory is applied to a situation than a child. They bring more experience to learning and that will both aid their learning and bring biases that hinder new learning. Even more than children, they learn by doing. Adult learning focuses on problems and the problems must be realistic. They do not need as much sequential learning or formal curriculum. With children and adult learning covered, what is heutagogy? Heutagogy is not age-based. It is the study of self-determined learning. It challenges some of the ideas about teaching and learning that are rooted in the teacher-centered learning that most of us experienced. There has been some natural movement from andragogy to heutagogy that has been generated by technology (media, Internet, online learning, MOOC) and by changes to formal education. This is especially evident in higher education where discussions of alternative degrees and ways of measuring mastery of learning and the patch to a degree are being discussed seriously. Hase and Kenyon (2000) coined the term heutagogy as self-determined learning which essentially means that a learner (rather than a teacher or institution) should be at the center of the learning. This learner-centric approach is very much a 21st century approach and is particularly popular in e-learning environments. PEDAGOGY is a a term I hear used by teachers, especially in the writing of reports & grants and in making presentations at conferences. I have found that since moving from the world of K-12 education (where all teachers have at least a general knowledge of educational theories and are required to attend professional development workshops on new techniques) to higher education, that professors are hesitant to talk about (some even hesitate at the pronunciation of the word) pedagogy. Pedagogy literally means "leading children." Andragogy comes much later and was a term coined to refer to the art/science of teaching adults. Malcolm Knowles and others theorized that methods used to teach children are often not the most effective ways of teaching adults. In his The Modern Practice of Adult Education, Knowles defines andragogy as "an emerging technology for adult learning." Adults over 21 are the fastest-growing segment of todayâ€™s "undergraduates," especially in distance and online education. That would seem to indicate that we should all be considering the implications of andragogy in our teaching. Although originally andragogy was seen as "pedagogy for adults", I now find theorists looking at it as an alternative to pedagogy. By this they mean that andragogy can be used as a learner-focused approach for teaching people of all ages. 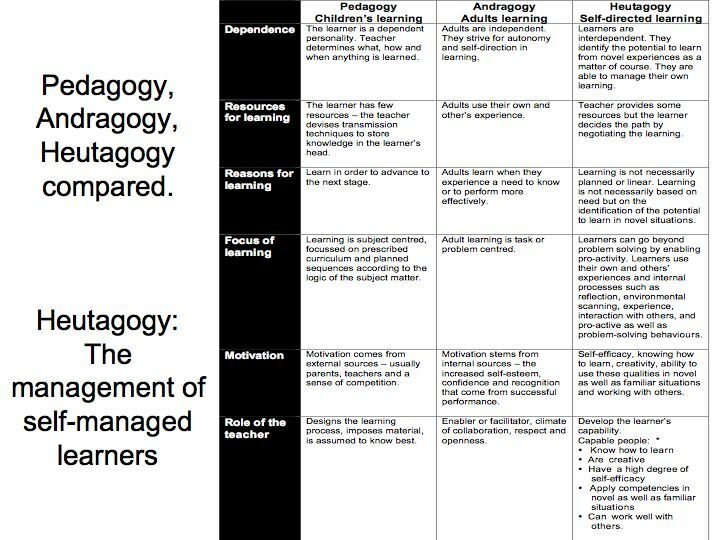 The contrast is then that pedagogy can be seen as a "teacher-centered or directive" learning, and andragogy as "learner-centered/directed" learning. What considerations might we make in designing courses for audiences that we consider to be adults? What considerations might we make if we want our course to be more learner centered? From the educational theory, I have sifted out these conditions. There are certainly things in that list that would benefit students of any age (learning styles, for example) but other items (life experience; input) do sound like more important considerations for the adult learner. I suppose that one reason all this is coming back into my focus is that I'm preparing a new graduate course for next semester and I know I'll be teaching students who are older, working in the field - and I'll be teaching them online. Should Colleges Follow For-Profit Model When It Comes to Teaching? I'm not sure exactly what my reaction is to this report I read about on The Chronicle's Wired Campus blog. It's a report from a group of IT experts who work for companies with ties to the Committee for Economic Development. They say that traditional colleges and universities can learn from for-profit colleges' approach to teaching, especially teaching that occurs online. What is it we can learn from them? Here are three points. 1. For-profit colleges are more likely than traditional colleges to use disruptive technology if it allows them to serve new markets, or serve markets more efficiently and effectively in order to profit. E-textbooks would be an example. 2. Many for-profits put more of an emphasis on instructor training before allowing them to teach online. These institutions, such as The University of Phoenix, REQUIRE (key word) faculty to participate in a multi-week training programs that include theories of andragogy. 3. Because they are profit-drive, these institutions pay closer attention to costs and outcomes and student achievement rates. The report committee sponsors include GE, Merrill Lynch and Company, IBM, McKinsey and Company, General Motors, and Pfizer. I was reading an article called "The Problem of 'Pedagogy' in a Web 2.0 Era" and it got me thinking about how often we throw around that term in higher education even though very few educators at that level have any formal training in it. Higher education faculty don't get any courses on pedagogy or learning theory in their degree programs. Faculty members in four-year universities are often researchers and their focus is on their research and not on how learning occurs and perhaps not even as much on their own disciplinary knowledge as those at other colleges. Of course, there should be faculty development efforts at all colleges and those should include workshops and presentations to increase awareness of the basic research in learning theory of the past few decades as well as what is being found currently. All teachers learn by teaching. That in itself is a learning theory that has several names attached to it. But that learning process is made more efficient by exposing faculty to what we know about pedagogy. That doesn't mean just learning the language of constructivism or Bloom's taxonomy. It means trying out lessons and being exposed to new approaches to what is often very old content. And if you are teaching older, non-traditional students, then you really should be aware of what has been found to work in the field of andragogy. Pedagogy literally means "leading children" and came first from studies of students in grades K-6 and then later included those in secondary school. Andragogy was a later area of study. Malcolm Knowles and others theorized that methods used to teach children are often not the most effective ways of teaching adults. I think many college professors would say that their students are often somewhere between those two -gogies. The 18 year old freshman, the 21 year old senior, and the 23 year old graduate student are very likely to sit in a classroom with a 28 year old freshman, 35 year old senior and a 50 year old graduate student. I would love to be in a discussion with a group of interested educators about some learning theory like "situated cognition." If the topic is new to the participants, all the better. Situated cognition is the name given to the theory that knowing is inseparable from doing. It proposes that all knowledge is situated in activity which is bound to social, cultural and physical contexts. To take this theory on means nothing less than making an epistemological shift from empiricism. To put it into action in a classroom would mean encouraging thinking on the fly rather than the typical back-and-forth of knowledge storage and retrieval. Cognition cannot be separated from the context. If it sounds radical, it's because it is radical. And yet, students and teachers have been doing it throughout their lives - though probably not very often in a classroom setting. Do I think this should be the new way to teach? No. But I would love to hear educators talking about it and about learning theories, pedagogy and andragogy with some of the same passion that they discuss their research, promotion and tenure, and contracts.